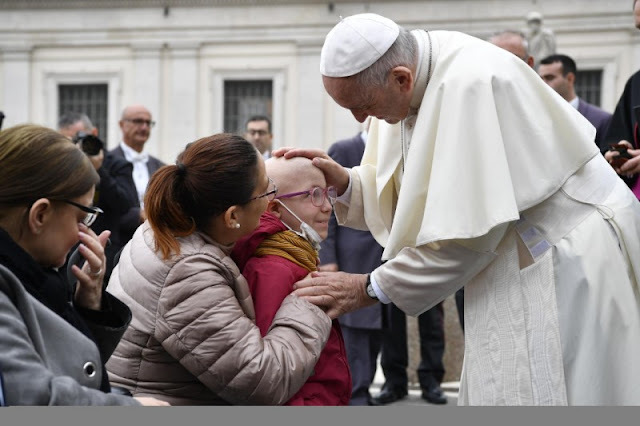 This morning's General Audience took place at 9.30 in Piazza San Pietro, where the Holy Father Francis met groups of pilgrims and faithful from Italy and from all over the world. In his speech in Italian, the Pope, continuing the cycle of catechesis on the Commandments, focused his meditation on: "Do not kill" according to Jesus (Biblical track: from the Gospel according to Matthew, 5: 21-24). After having summarized His catechesis in several languages, the Holy Father addressed particular expressions of greeting to the groups of faithful present. Today I would like to continue the catechesis on the Fifth Word of the Decalogue, "Do not kill". We have already underlined how this commandment reveals that in the eyes of God human life is precious, sacred and inviolable. Nobody can despise the life of others or their own; in fact, man carries within himself the image of God and is the object of his infinite love, whatever the condition in which he was called into existence. In the passage of the Gospel that we have just heard, Jesus reveals to us an even more profound sense of this commandment. He states that, before God's court, even anger against a brother is a form of murder. This is why the Apostle John wrote: "Whoever hates his brother is a murderer" (1 Jn 3:15). But Jesus does not stop at this, and in the same logic he adds that insult and contempt can also kill. And we are used to insulting, it's true. And there's an insult like a breath. And Jesus tells us: "Stop, because the insult hurts, kills". The contempt. "But I ... these people, I despise him". And this is a form to kill the dignity of a person. It would be nice if this teaching of Jesus entered the mind and the heart, and each of us would say: "I will never insult anyone". It would be a beautiful purpose, because Jesus tells us: "Look, if you despise, if you insult, if you hate, this is murder". No human code equates such different acts by assigning them the same degree of judgment. And coherently Jesus even invites us to interrupt the offering of the sacrifice in the temple if we remember that a brother is offended against us, to go and look for him and reconcile with him. We too, when we go to Mass, should have this attitude of reconciliation with the people we have had problems with. Even if we thought bad about them, we insulted them. But many times, while we wait for the priest to say Mass, we talk a bit and talk badly about the others. But this can not be done. Think of the gravity of the insult, of contempt, of hatred: Jesus puts them on the line of killing. What does Jesus mean by extending the field of the Fifth Word to this point? Man has a noble, very sensitive life, and possesses a hidden self no less important than his physical being. In fact, to offend the innocence of a child is enough an inappropriate sentence. A gesture of coldness is enough to hurt a woman. To break the heart of a young person is enough to deny him trust. To annihilate a man, just ignore it. Indifference kills. It is like saying to the other person: "You are a dead man for me", because you killed him in your heart. Not to love is the first step to kill; and not to kill is the first step to love. In the Bible, at the beginning, we read that terrible phrase that came out of the mouth of the first murderer, Cain, after the Lord asked him where his brother is. Cain replies: "I do not know. Am I my brother's keeper? "(Gen 4,9). So the killers speak: "it does not concern me", "they are yours", and similar things. Let's try to answer this question: are we the guardians of our brothers? Yes, we are! We are custodians of each other! And this is the path of life, it is the path of non-killing. Human life needs love. And what is authentic love? It is what Christ showed us, that is, mercy. The love we can not do without is the one that forgives, which welcomes those who have harmed us. None of us can survive without mercy, we all need forgiveness. So, if killing means destroying, suppressing, eliminating someone, then not killing will mean curing, valuing, including. And also forgive. No one can deceive himself by thinking, "I'm fine because I do not do anything wrong". A mineral or a plant has this kind of existence, but a man does not. A person - a man or a woman - no. A man or a woman is required more. There is good to do, prepared for each of us, each his own, which makes us ourselves to the end. "Do not kill" is an appeal to love and mercy, it is a call to live according to the Lord Jesus, who gave his life for us and rose for us. Once we have all repeated, here in the Piazza, a phrase of a saint on this. Perhaps it will help us: "Do no harm is good. But not doing good is not good ". We always have to do good. Go beyond. He, the Lord, who incarnated has sanctified our existence; He, who with his blood has made it priceless; He, "the author of life" (Acts 3:15), thanks to which everyone is a gift from the Father. In him, in his love stronger than death, and through the power of the Spirit that the Father gives us, we can accept the Word "Do not kill" as the most important and essential appeal: that is, not killing means a call to love . Cf. Catechism of the Catholic Church, 2259: "Writing, in the account of the killing of Abel by brother Cain, reveals from the beginning of human history, the presence in man of anger and greed, consequences of sin original. Man has become the enemy of his fellow man. God declares the wickedness of this fratricide: "What have you done? The voice of your brother's blood cries to me from the ground! Now be cursed far from that ground which by your hand drank your brother's blood "(Gen 4, 10-11)." Je suis heureux de saluer les pèlerins venus de France et de divers pays francophones, en particulier des pèlerins de Chambéry et de Nancy, avec leurs évêques Mgr Ballot et Mgr Papin, tous les jeunes présents, ceux de Versailles, de Paris, de Fougères, de Bucquoy, de Rouen et d’Évreux, ainsi que des pèlerins de Namur. Puissions-nous accueillir en Jésus, dans son amour plus fort que la mort, et par le don de l’Esprit du Père, le commandement «tu ne tueras pas». C’est l’appel le plus important et le plus essentiel de nos vies: l’appel à l’amour ! Que Dieu vous bénisse! I greet the English-speaking pilgrims and visitors taking part in today’s Audience, particularly those from England, Scotland, Denmark, Iceland, Norway, Ghana, Nigeria, South Africa, Uganda, Indonesia, Canada and the United States of America. In this month dedicated to praying the rosary, may Our Lady of the Rosary accompany you, and upon all of you and your families, I invoke the joy and peace of our Lord Jesus Christ. God bless you! Saúdo os peregrinos vindos de Portugal e do Brasil, particularmente os fiéis de Itu, Várzea Paulista e Tubarão. Queridos amigos, cuidar do irmão, especialmente de quem passa necessidade ou é esquecido pela cultura do descarte, significa crer que cada homem e cada mulher é um dom de Deus. Não poupemos esforços para que todas as pessoas possam sentir-se sempre acolhidas e amadas nas nossas comunidades cristãs. Que Deus vos abençoe! أرحّب بمودّة بالحاضرين الناطقين باللغة العربيّة، وخاصة بالقادمين من سوريا، ومن العراق ومن الشرق الأوسط. لقد أوضح يسوع أن وصية لا تقتل تشمل أيضا كل الأعمال والأقوال التي تسيء لسمعة الآخر وتحط منه وتقلل من كرامته، كالغضب والنميمة وسوء المعاملة. لقد قدم يسوع هذه الوصية بطريقة تتخطى مجرد المنع من القتل لتنفتح على رحاب المحبة الواسعة: لا تقتل تعني أحبب وافعل ما تشاء. ليبارككم الربّ جميعًا ويحرسكم من الشرّير! Witam serdecznie pielgrzymów polskich. Wczoraj minęło 40 lat od wyboru na Stolicę Piotrową Karola Wojtyły, św. Jana Pawła II. Oklaski dla św. Jana Pawła II. Jakże aktualne są jego słowa, wypowiedziane w dniu inauguracji pontyfikatu: Nie lękajcie się! Otwórzcie, otwórzcie na oścież drzwi Chrystusowi! Niech nadal inspirują one wasze życie osobiste, rodzinne i społeczne; niech będą zachętą do wiernego kroczenia za Chrystusem, dostrzegania Jego obecności w świecie, w drugim człowieku, zwłaszcza w ubogim i potrzebującym pomocy. Człowiek, bowiem, jak nauczał Papież z rodu Polaków, jest drogą Kościoła. Z serca Wam błogosławię. I am pleased to welcome the Capitulars of the Missionary Benedictines of Tutzing and the participants in the World Conference of Radio Maria. I greet the parish groups; the military and civil personnel of the Air Force Logistic Command; the Delegation of the "People of the Family"; the Italian Center helps children; the Hematopic Child Association and the Villa San Francesco Community. Today is the liturgical memorial of St. Ignatius of Antioch, bishop and martyr in Rome. We learn from this holy bishop of ancient Syria to courageously witness our faith. Through her intercession, the Lord gives each of us the strength of perseverance, despite adversity and persecution.